Ever wondered about the future of music? Look no further and get ready for the Future Music Festival. 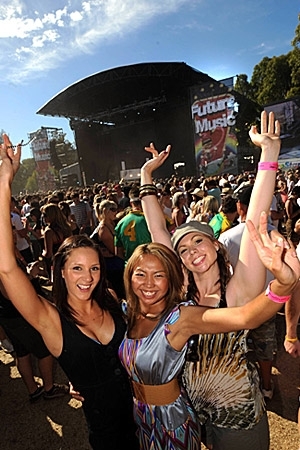 The event celebrates the ultimate sounds of tomorrow with a 10 hour 'sonic boom' that travels around the major capitals of Australia at the 'speed of sound' and is set to become the nation's biggest music festival. The event is unique in the sense that it blends the biggest names of electronic music with the hottest performers in Hip Hop, Pop, Indie Rock and other Alternative genres. In previous years, the festival has played host to the iconic likes of N*E*R*D, Basement Jaxx, The Chemical Brothers and many more. In 2011, the Future Music Festival will return to Rundle Park in Adelaide and continuing with its tradition of showcasing the globe's finest future music artists and peformers, organisers boast an even bigger and better lineup in 2011. BookToday has a wide range of Future Music Festival accommodation options. Come and be a part of the hype and energy taking Australia by storm. We have the best budget accommodation deals in Adelaide. If you require further assistance with your booking, please call 1300 733 274 and speak with one of our friendly customer service assistants.